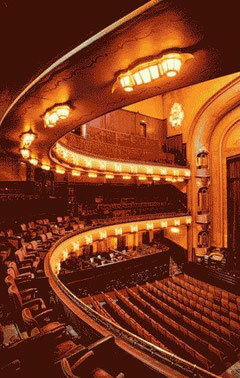 TUSCHINSKI THEATRE - De website van tuschinskimultiplexcinema! Today, the Tuschinski Theater is still the most beautiful cinema in the word. The remarkable atmosphere from the Tuschinski Theatre,still creates a warm ambiance. That makes that returning visitors are guaranteed. 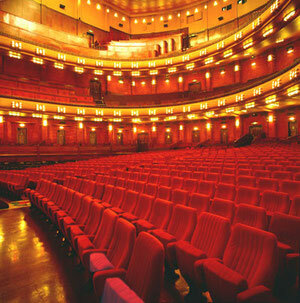 Each visitor that has visited the Tuschinski Theater has a special memory about it. The building is designed by architect Hijman Louis de Jong. The Tuschinski Theater was built in different styles, including Amsterdam School, Jugendstil and Art Deco. The lushly decorated façade in that remarkable, completely unique style, maybe best titled as ‘Tuschinski Art Deco” is completely decorated with glazed tiles and ceramic sculptures, beautified with wrought iron decorations and lamps by the hand of Barend Jordens. The remarkable, warm hand-knotted carpet with the well-known eagle, in combination with the Eastern appearing architecture of the facade with its striking towers has an inviting function: it was meant to lead the audience into an illustrious world in which the lush interior served as suitable surroundings for the soon under guidance of the movie organ and theatre orchestra to be shown films and music hall performances. 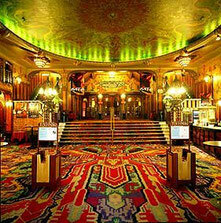 The Tuschinski theatre did not only become extraordinary in architectural and decorative aspect. The electrical installation also was well ahead of its time and with the revolutionary heating and ventilation system, the temperature was kept even all throughout the theater. The Dutch Tuschinski Theater in Amsterdam, built upon assignment by Abraham Tuschinski, Herman Ehrlich and Herman Gerschtanowitz is considered to be one of the most beautiful cinemas in the world. Abraham Tuschinski was the man who wanted every millimeter of the Tuschinski Theater in its exact spot and so it happened. As opposed to his brothers-in-law Ehrlich and Gerschtanowitz; they were much more complaisant in that. It seems as though Abraham Tuschinski was the architect. Before World War Two, all three of the brothers-in-law had an equal share, rights and obligations of the Tuschinski Theater and the other Tuschinski theaters. Fact is, there are still assets of Abraham Tuschinski and Herman Ehrlich in the Tuschinski Theater. The biggest loss however is the deportation to the gas chambers of those who made the Tuschinski Theater to be the unforgettable dream palace of the old times: Abraham Tuschinski, Hermann Ehrlich and Hermann Gerschtanowitz.